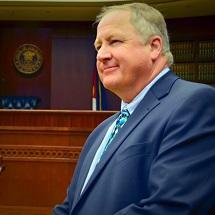 PERSONAL STATEMENT: Rich has been practicing law in Colorado since 1983. Rich practices primarily in the areas of family law and divorce, estate planning, probate administration, construction disputes and general civil litigation. Rich is a founding member of Arnold & Arnold, Attorneys at Law, LLP, having merged his practice with the practice of his wife, Jean Arnold, in 1994. Rich has been in the private practice of law virtually his entire career, with a three and one-half year stint as in-house counsel for a large electrical construction company from 1987 to 1990. Rich began a solo practice in 1990 in Littleton, Colorado. That practice continues today as part of Arnold & Arnold, LLP. Rich’s approach to the practice of law is to strive to provide responsive personal service to all clients, while balancing the often competing goals of financial success, highly competent legal services, and appropriate community service. Rich particularly enjoys the role of counselor to his clients, giving guidance and advice, as well as the personal satisfaction of successful courtroom advocacy. Rich’s personal interests include skiing, biking, golfing, hiking, ceramic sculpture, reading and music. Rich is involved in a variety of community service organizations including the Ken-Caryl Ranch Foundation, The Denver Law Club, and the St. Francis Center. Over the past quarter century Rich has performed thousands of hours of community service including pro bono legal assistance service for variety of community and church based organizations. Rich twice earned volunteer of the year honors with Denver Urban Ministries. Rich and Jean Arnold have been married 38 years and have two adult children.